To my mind, there’s little better indicator of a damaged society than any where so-called “superjuice” is allowed to exist and be sold by the 2-litre. Slammed and damned for years now given its havoc-wreaking influence on so-called “dry” communities (typically isolated ones) in Manitoba, little has been (or can be) done, apparently, to stem the tide of violence superjuice causes. I wrote about the alarming influence of superjuice on the Garden Hill First Nation today as part of a sentencing hearing for two kids who bashed a guy to death while hopped up on the homebrew. It probably won’t surprise any that calls regarding the harm superjuice causes has been ongoing for many years. (link also describes how it’s made and the immense profits from selling it). It appears nothing has changed in all that time. A report recently written for the court still describes high prevalence of superjuice in Garden Hill. Aside from the fact it reinforces my “Manitoba has a drinking problem” beliefs, I’m simply shocked more can’t be done to stem the smuggling of superjuice yeast into northern communities. They’re not that big. Garden Hill is about 3,300 people. Until this problem gets dealt with, we’ll continue to see the cycle of extreme violence in communities. And to me, that’s just wrong. I wonder if the province made interdiction of superjuice a priority when penning the newest municipal policing contract with the RCMP? (It’s in effect for two decades). Should the aboriginal groups contesting the issuing of the contract without their input win their case, will they? There are things we can do about out horrific crime issues that don’t require groveling to Ottawa for permission. 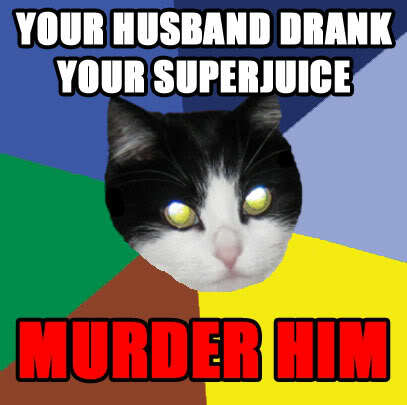 Eradicating superjuice would be but one of them. Drinking booze should be a government regulated test like drivers licenses. At 18 you go to a gov’t office & they feed you booze. After the drinks a psychological evaluation is done by a professional & if you are diagnosed as argumentative & violent when you get drunk, BOOM! No booze for you! That person gets no drinking license & anyone caught feeding booze to the unlicensed is arrested. And there you have it. Problem solved. You’re welcome citizens of Earth. Yeah, prohibition has ALWAYS worked. Why do you think this stuff exists in the first place? @Dave Rhodes – Who said anything about prohibition? It’s called Auto-Brewery Syndrome and it happens when there’s persistent and chronic fungal infection. If the people really are exhibiting the symptoms described in the article than it’s a symptom of a MAJOR immune deficiency in the population. These people should be getting medical attention for whatever is trashing their immune systems to the point where they can’t fight off a little yeast. Alcoholism may be a factor in suppressing their immune systems, but in teenagers?